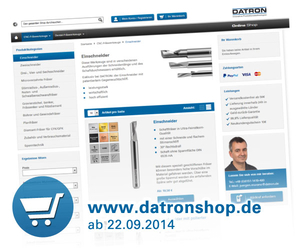 Mühltal, Germany, 15 September 2014 - DATRON AG, a leading machine builder in Muehltal near Darmstadt, today announced the relaunch of its online shop for tools and accessories scheduled for 22 September 2014. Immediately after the AMB show in Stuttgart (DATRON hall 7, booth A52) the DATRON online shop will appear in a new design and provide customers with a variety of new features. DATRON has improved the shopping experience significantly by making it more intuitive and by completely overhauling the design of the web platform. With the new web appearance the way is paved particularly for a future expansion of the dental market. The DATRON relaunch will take place in the context of an innovation offensive that envisages new dental products and consumables for 2015. "It was our goal and the internal target for the relaunch to provide clients with both a positive brand feeling and simultaneously offering an uncomplicated shopping experience. With the new shop we aim to convince our target groups of the advantages of DATRON milling tools and accessories. 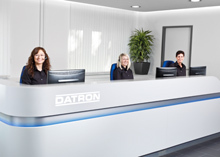 Ultimately, our goal is to maintain and expand our leading position," says Michael Daniel, CFO at DATRON AG. "Besides the new design, our focus was primarily on improving the shop usability. We have implemented many best practice aspects. The new DATRON shop is the perfect base for the expansion of our range of both new tools and accessories, as well as on consumption products and services for our customers, "explains Jürgen Murano, head of CNC and dental tools at DATRON AG. 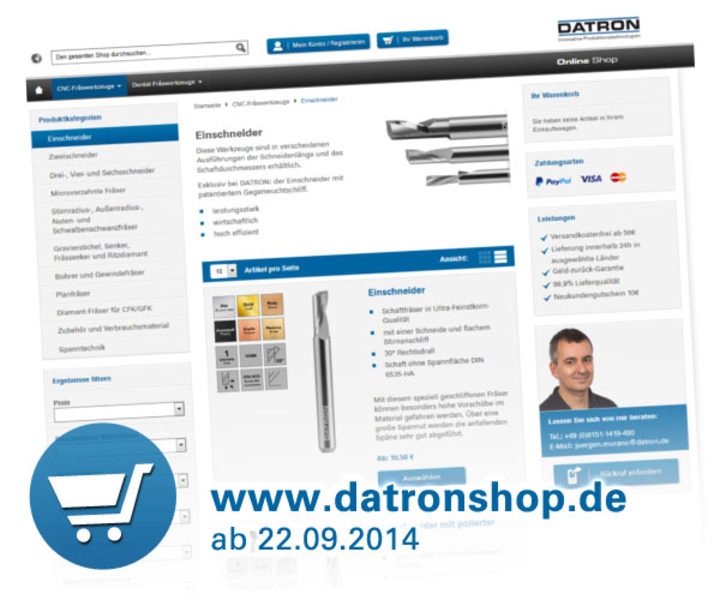 The relaunch of the DATRON online shop initially is scheduled in the first step for the German customers only, however, the online presence will be gradually opened to foreign markets. DATRON AG is a publicly traded and internationally active specialised machine construction company from Mühltal-Traisa near Darmstadt. Its core products are CNC milling machines for high speed cutting (HSC) and 3D engraving, dental milling machines for the efficient processing of all common denture materials in dental laboratories, dosing machines for accurate and quick bonding and sealing, tools for high-speed processing and after-sales services such as training, support and sale of accessories and spare parts. The company founded in 1969 currently employs around 200 people, and with more than 20 representative offices and agents worldwide, generated EUR 33.5 million in sales in 2013.